Finally, after 2+ years of searching, the dress is finally sitting in my house. Okay, actually not, I sent it for dry cleaning because I got an off-the-rack dress. It is actually NOT recommended by DBR. But who doesn't want to get married in a clean dress. So I took the risk. Will definitely let you guys know how it turns out. 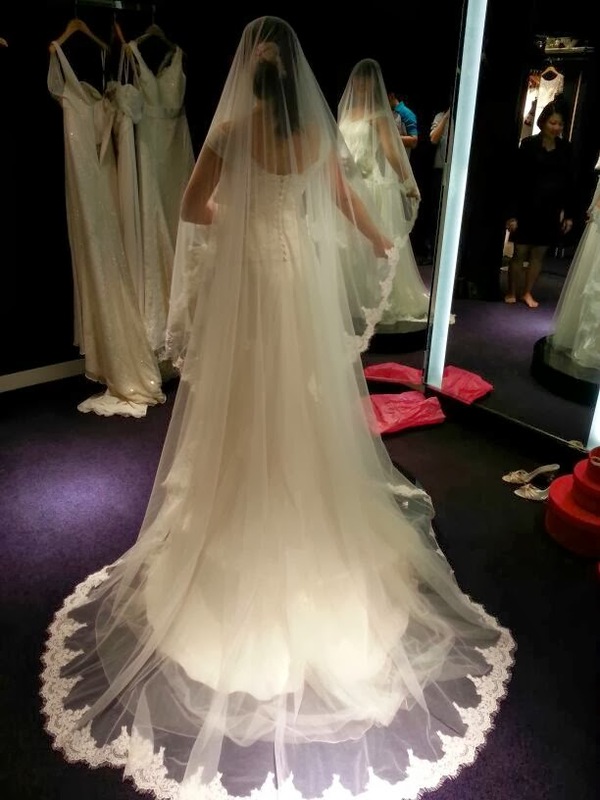 I got a bride-to-be who based in Singapore asking for advice on getting her gown from DBR. 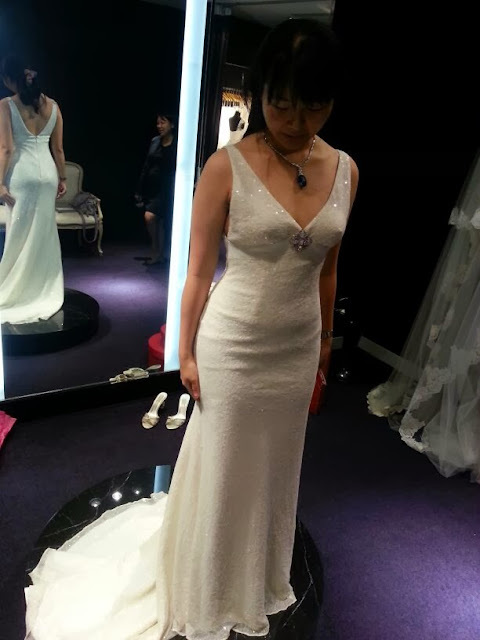 In fact, I was told that another bride also from Singapore actually bought a dress from DBR after reading my blog during my visit this time (And damn! they never give me referral fee :P) So I guess I shall share some commonly asked Q&A here. 1. Is it cheaper to get the dress from DBR compared to Singapore? Well. I would say IT DEPENDS. They carry a variety of brands. 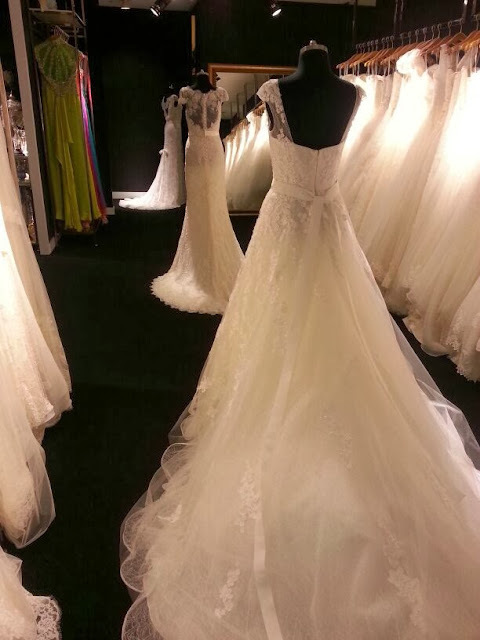 Spanish brands like Pronovias tends to be more expensive and in the range of RM20k. My favourite, Lusan Mandongus and Annasul Y is around RM10k, with dresses from RM5k to RM20k. Dresses I saw in Singapore starts from SGD3k, while those slightly branded or more fancy one easily starts from SGD5k or even SGD8k. So I guess after some currency conversion, it might work out slightly cheaper. Yet, please take note that you have to travel to KL to choose the dress and for fitting as well. 2. How many trip did I make for my dress? 2 years ago, I have been to DBR 2 times. 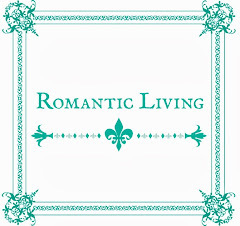 So I pretty much have quite a good idea of their offering and style. Even with comparatively good understanding, I made 5 trips for my dress. 1st trip - Choosing the dress. I sort of decided on the dress after the first trip but they didn't took my measurement. Perhaps they want to allow the bride to really think through it? 2nd trip - This trip is to double confirm the dress, I tried a few more but eventually still decided on the original dress. Measurement taken. I think if you are very certain of the dress and have allocated abundant time at DBR, you might able to combine first and second trip. 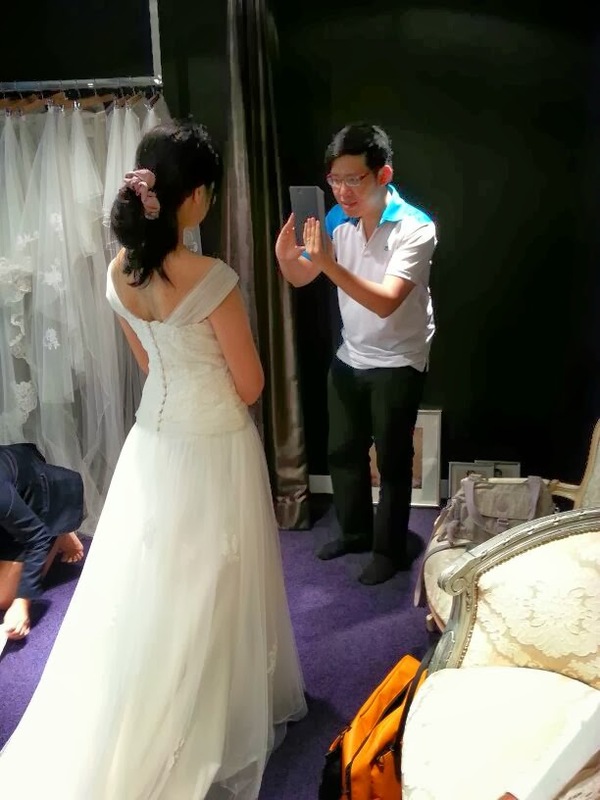 3rd trip - First fitting. If you are lucky, the dress might fits you like gloves and you can bring it back. However, don't count on it. If your dress is new, this might be few months away after your previous trip and chances are you changed. And unless you have taken your previous measurements with your actual wedding shoes and lingerie, the measurements are not going to be accurate. 4th trip - I made an additional trip for 2nd alteration and 2nd fitting because the inner most layer of my dress is a body hugging mermaid style and they need to get the seamstress down to look at it and work on it. Hopefully for most bride this is not necessary. 5th trip - Final fitting and collection. Since I am making all these trips within such a small time frame (less than 2 months), it gets pretty tiring and costly, even I got the stay with my parents in KL. I was told that the bride from Singapore brought back the dress to Singapore for alteration. So if you know some good seamstress, this might be the way. 3. Is the collection huge? I guess they have around eighty to hundreds on the rack? Here's a shot of it (not allowed but my brother took it without them knowing :P). There's another side of the room with another half of the dress. And finally, Here's the pictures of the corset on my dress. There are 3 waist stays (the 3 thick elastic band with white hook). One each for breast, waist, and hip. Waist stay and boning of the bodice is basically the main structure that holds a strapless dress onto your body (see here). 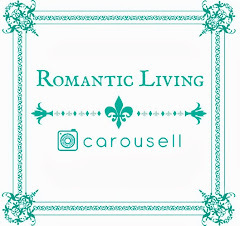 But you will be surprise that a lot of strapless dress nowadays doesn't have these structure and expect the bust to hold up the dress, which of course they don't and you will see girls keep pulling up their strapless dress whole day. 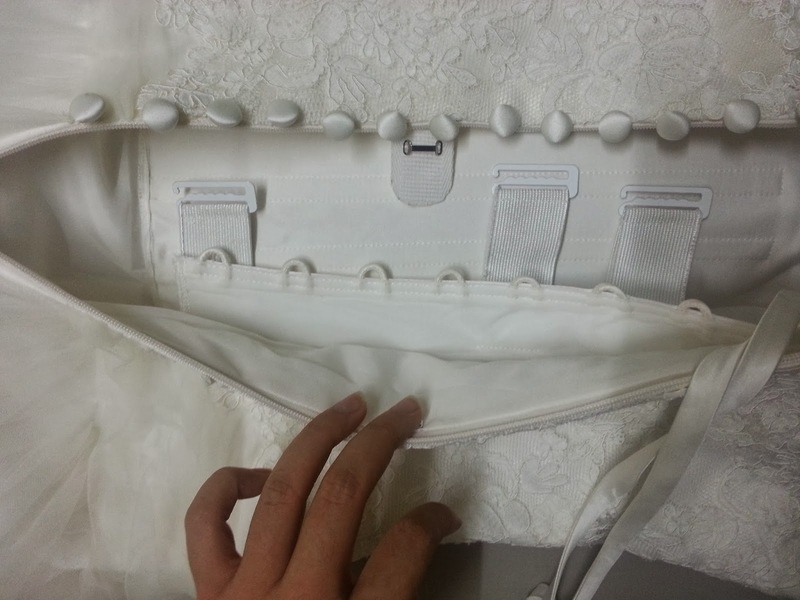 The waist stay is adjustable, so that you can adjust the size according to your body condition on the actual wedding day. Girls body shape fluctuates throughout the month, so what might fit snugly 2 weeks ago might not fit at all 2 weeks later. On top of that, you can lace the corset. This is not a "for show" constructs if it is made up of tough materials. The benefit of lace compare to the waist stay is that it is not elastic so you can really pull it in on the waist area to create a smaller waist. 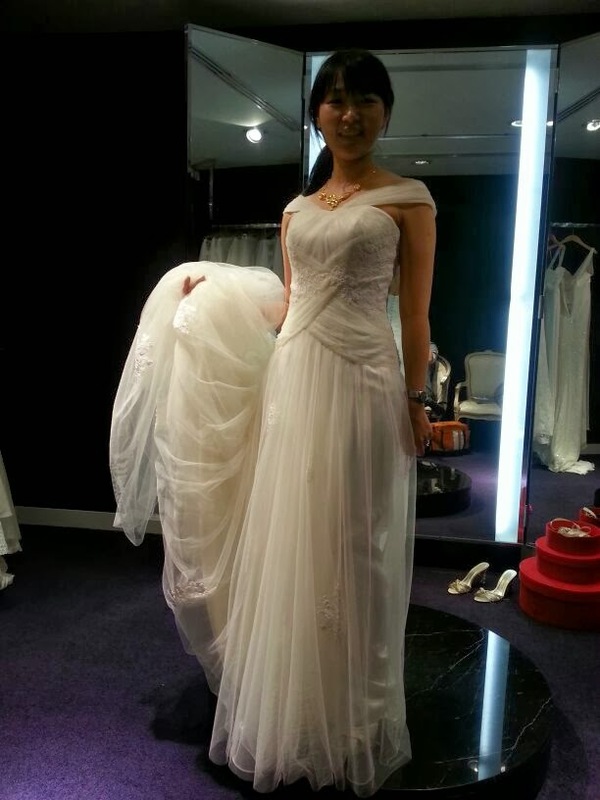 In fact, during the fitting, they pull in so much that I think my waist just got smaller by an inch, but I was hardly breathing :P.
Without corset, it is not possible for me to wear this dress. Really, your post is informative, thanks a lot for sharing this post that is very useful for us.